Every year in December, MTA New York City Transit, the agency which operates NYC's buses and subways, brings out their own electric train set for the holidays. 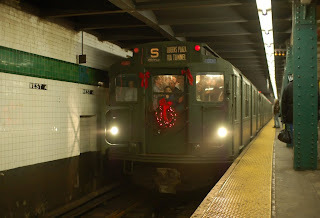 It's the special Holiday Nostalgia Train, of fully restored subway cars from the 1930s, when the city-owned IND system began running. The old cars hearken back to another era, with their wicker seats, open ceiling fans, and incandescent lighting. It was a time before high-tech, when everything was done manually. Subway operation was a much more rugged business then. No automated train announcements, software, or computer-controlled navigation. 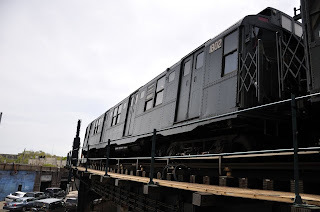 These cars ran in the NYC subway until the 1970s, and were the last Pre-WWII trains purchased by the city. So come on out and catch the Train To Chrismas Past! You might even meet me along the way. Nathan, Delvon And DJ Critique The OMA's! TONIGHT: The Out Music Awards!